Playing with toys is one of the joys of childhood. Unfortunately, not every child will be able to have a toy of his or her own, especially those living in poverty. One woman, Shweta Chari, is slowly changing this situation in her native India, through her non-profit organisation Toybank. Besides donating toys and educational board games to underprivileged children, Toybank has also set up ‘toy libraries’ where Shweta and her volunteers conduct play sessions with the children. 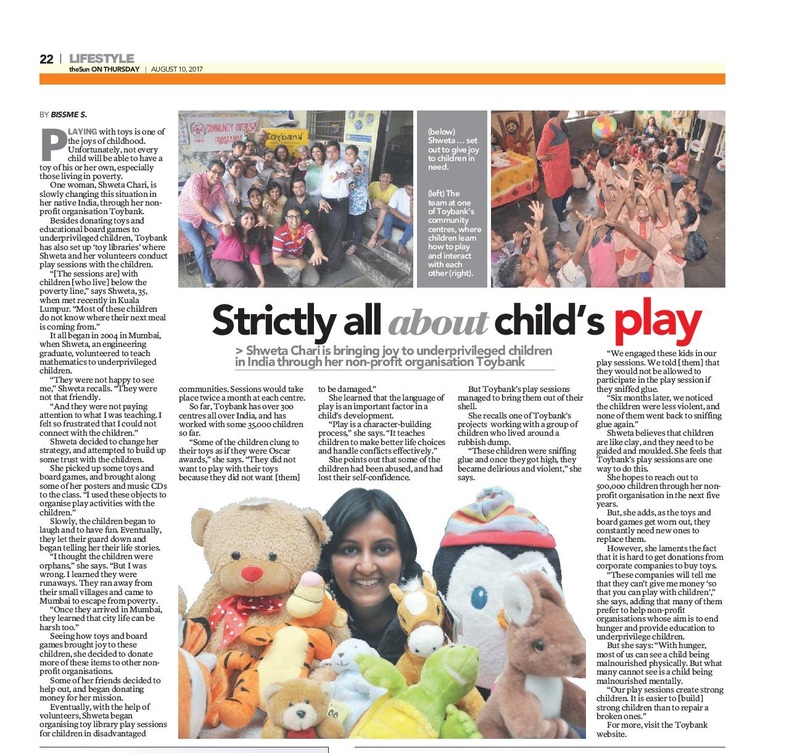 “[The sessions are] with children [who live] below the poverty line,” says Shweta, 35, when met recently in Kuala Lumpur. It all began in 2004 in Mumbai, when Shweta, an engineering graduate, volunteered to teach mathematics to underprivileged children. “They were not happy to see me,” Shweta recalls. Slowly, the children began to laugh and to have fun. Eventually, they let their guard down and began telling her their life stories. “I thought the children were orphans,” she says. Seeing how toys and board games brought joy to these children, she decided to donate more of these items to other non-profit organisations. Some of her friends decided to help out, and began donating money for her mission. Eventually, with the help of volunteers, Shweta began organising toy library play sessions for children in disadvantaged communities. Sessions would take place twice a month at each centre.So far, Toybank has over 300 centres all over India, and has worked with some 35,000 children so far. “Some of the children clung to their toys as if they were Oscar awards,” she says. She learned that the language of play is an important factor in a child’s development. “Play is a character-building process,” she says. projects working with a group of children who lived around a rubbish dump. “These children were sniffing glue and once they got high, they became delirious and violent,” she says. Shweta believes that children are like clay, and they need to be guided and moulded. She feels that Toybank’s play sessions are one way to do this. She hopes to reach out to 500,000 children through her non-profit organisation in the next five years. But, she adds, as the toys and board games get worn out, they constantly need new ones to replace them. However, she laments the fact that it is hard to get donations from corporate companies to buy toys. hunger and provide education to underprivilege children. But she says: “With hunger, most of us can see a child being malnourished physically. But what many cannot see is a child being malnourished mentally. For more, visit the Toybank website.